I thought I had caught up with the collecting mania. My Breitling set me back enough to where I am still paying Mr. Visa for it. I recently sold an espresso machine and some vintage audio equipment to help pay off the Breitling when the inevitable happened. Yes. It showed up on a forum. You know what I mean, a ‘thing’ that you are not looking for but know about and had thought about, and when it appears you know you have to act upon. This ‘thing’ showed up on a forum two weeks ago. I happened to see it early, I acted and was lucky to be first to commit money to it—and I do mean lucky. I am not much of a divers' watch fan (I haven't strapped a tank in nearly thirty years), but this was too much to pass up. 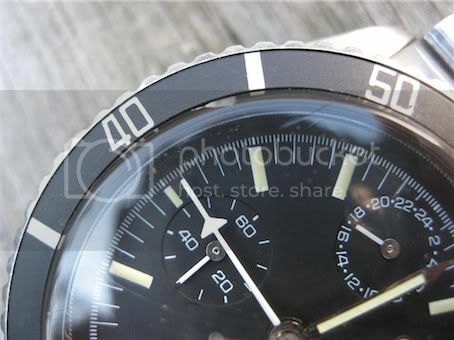 I saw the "4" in the "40" on the bezel and nearly swooned. It is proportioned just right for me and the bracelet is authentic. Unfortunately the winding rotor seems a bit wobbly, but like a true Lemania, it winds, functions, and keeps time impeccably. Pascal might recognize this piece. I got it from a certain C. Antista who obtained it around the same time Pascal got his "Chuck" Lorenz I believe. 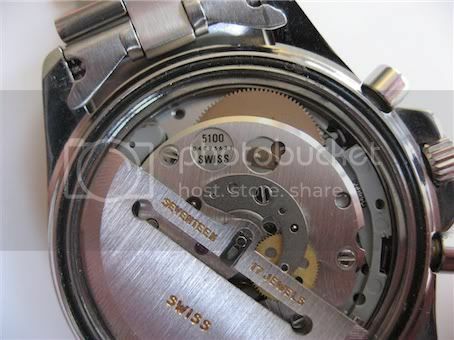 I very much like the stark simplicity of this Lorenz without a tachymetre ring or numbers. The three main hands are, to me, gorgeous. I also like the unusual (for me) variation of numbers used in the subdials. The signature Lemania chronograph sweep minute hand is well proportioned here and, when parked at 12:00, sits unobtrusively. In use, though, its white tone stands out very clearly. Nice. Very nice. 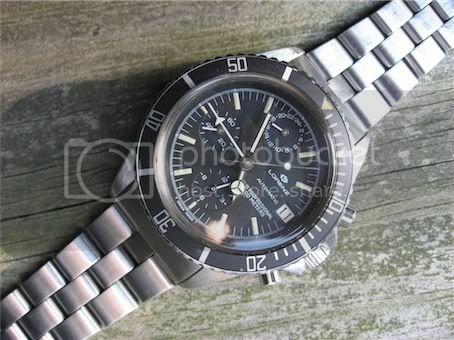 So while I am not much closer to paying off my Breitling, I do have a very unique addition to the Lemania collection! If I hadn't just picked up something else which depleted the fund for a while, I would have been mightily tempted too. The only thing about it that I am not 100% sure I like is the Mercedes hour hand, although I don't hate it!! I hope you will forgive me a little chuckle here. The reason? Well, I have been expecting this post. If I can, I would like to tell you a little background. I have recently decided that a few of my collection will go, and that almost my only "to buy" Lemania left on the list was this one. There are a few others, but this one was top of the list. 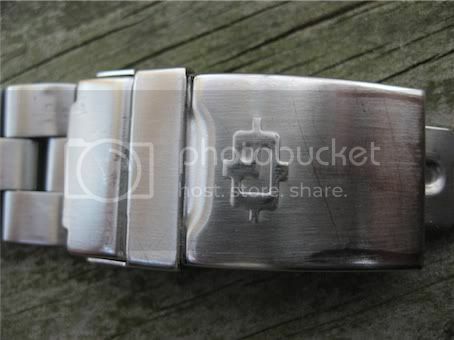 So I did a lot of picture surfing/searching, and other than a blue version of this watch sold a while back on EBay, Chris' was the most obvious example in the forum community. So I PMed him. He had said that he wasn't really keen to sell, but since I mentioned it, he would consider it. After a few e-mails and a couple of weeks, Chris came back to me with what I can only describe as an, er, "optimistic" price (imho). "Come on Dave, this e-mail is being read in America. I sent you my f*** off price, if you had gone for it I would have been very pleased. Stop being so prissy and make me an offer"
So I did. Still too low, in Chris' eyes, but having got used to the idea of selling, he had decided he would put it on the market. Of course I followed the sale, and am very happy that such a prodigious Lemania collector has snagged it. Well done, a great catch, and one I am more than a little envious of. Everything you say about it is right. 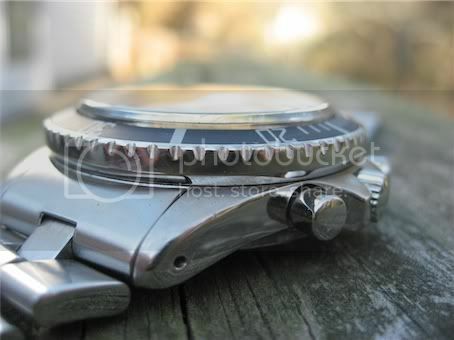 It is one of the best-specified L5100s, and best looking too, in a more traditional, Rolex-like case or DeLuca type mould of a dressy tool watch. It covers so many bases, and all of them very well (even if it dos have a mercedes hand). I have found other versions currently available (like Pascals, with the silver sub-dials), but this one is my favourite, other than the plain blue version, and I cannot find one just now. I was surprised that no one else here made mention of the sale. Lorenz is well-known amongst Lemaniacs and this particular version is unusual. It came at an awkward time for me financially, but things evened-out in the end. But I enjoyed your story, Dave. It makes me chuckle, too. BTW I managed to knock $50 off the asking price. It was still a bit expensive for a Lorenz, but all told, a reasonably fair deal. Pieces like this do not come along very often. I am enjoying it much, much more than I would have imagined. That makes it worthwhile at (nearly) any price and is the point in collecting, yes? And I actually like the tri-point "Mercedes" hour hand. Then again, I do not have any others like it. Um, I'll take "prodigious" in the positive sense! I am a small fellow in size, but my watch collection is most certainly getting very Lemania-heavy! Last edited by danomar; 13-03-2011 at 22:54. We learn every day, or at least I do - that's super; really, really nice - the mercedes hand is not my favourite but I'd easily forgive that in the context of the rest of the watch. The bezel is lovely - I can see why you like it - very stylish, but also a 20 min minute division, better than the 15 min I think, even if just to stand apart from the crowd. Very nice numerals - very cool. 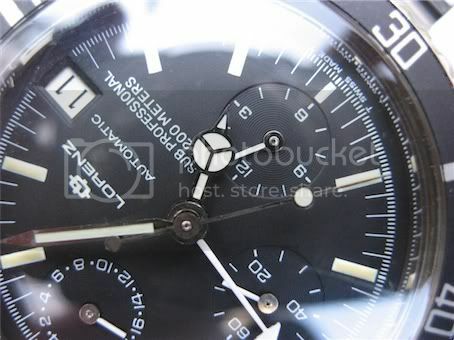 Clear subdials and chrono hands as you say - yup, very good. The case/sub look is very smart too, it looks very solid, Rolexish and I like the way the pushers and crown have been integrated - I can see why you decided to go for it and glad to hear you're enjoying it! Soooo much better than their current offerings. 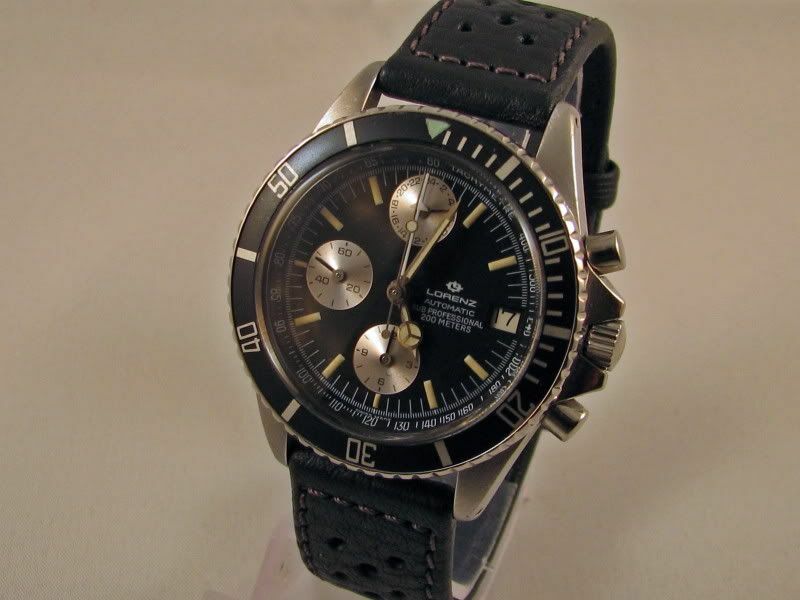 This was the version I initially was after in my long quest for this watch that spanned several years. The only thing is that I wanted mine to have the tachy chapter ring that seems to be missing from many black on black dialed examples. In the end, I got lucky and in no small part thanks to Dave I managed to get the silver on black dialed example that is one of the stars of my collection. 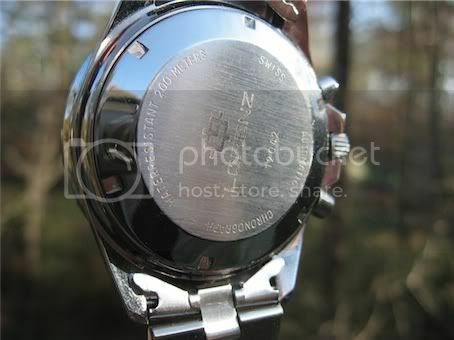 Like mine, yours is a relatively early one, as made apparent by the dial inscriptions, bezel insert and luminous triangle. Lovely catch! Well done! It is interesting to see how positioning of the "Lorenz/Automatic/Sub Professional/200 Meters" differs between mine and Pascal's versions. 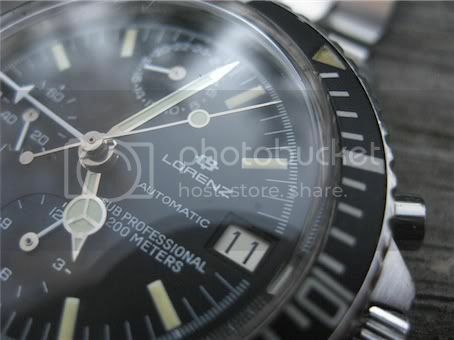 My guess is that the all-black dial looks better with the words spaced out while it looks more appropriate in a text block with the silver subdial version. 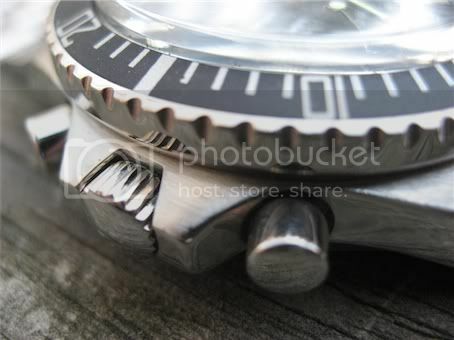 Details such as these are hallmarks of a company that is truly paying attention to detail. This is why we like Lorenz, yes? BTW i can recommend this Lemania service. You see mine in the top right corner.